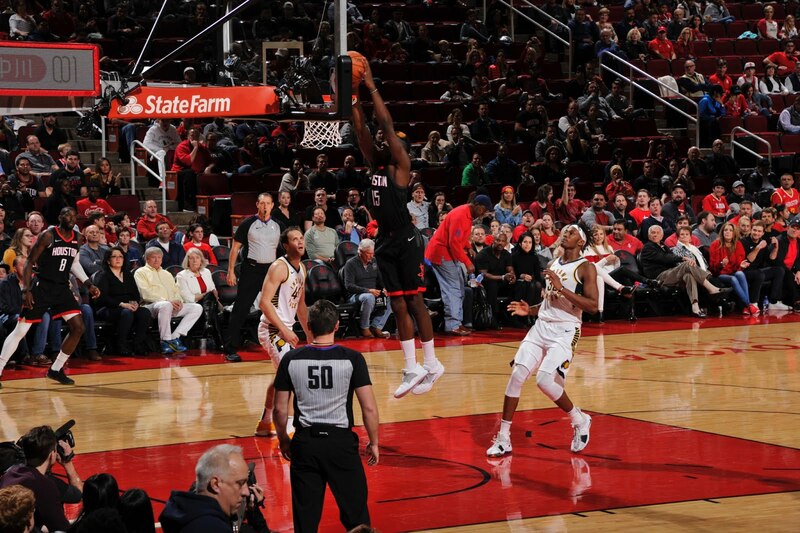 The Houston Rockets scored more than 100 points in a basketball game. This everyday occurrence last season has turned into a rare pleasure, with the Rockets failing to score three digits in a game four games in a row. Since their win against the Brooklyn Nets on November 2nd, Houston has put together a truly desultory offensive run. 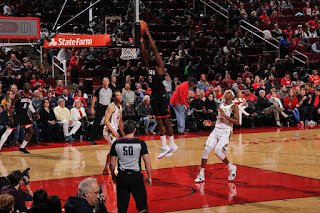 After shooting a horrifying 33% from the field the previous night in San Antonio, the Rockets found their stroke again and won a game against a quality Indiana Pacers team by a comfortable margin. The Rockets might have forgotten how to shoot free throws (23-32, and it started even worse), but they remembered how to make a shot. Their 48.6% overall was quite good while their 42.6% from three point range was blistering. James Harden alone went 8-18 from deep, accounting for 24 of his 40 points. Eric Gordon may have shot 2-9 from beyond the arc, but the rest of the team was hot enough that it didn't matter. Behind their rediscovered shooting stroke, the Rockets pulled away to a 22-point lead at halftime and ended with a relatively slim 12-point margin. When the shots began to fall, the Rockets looked re-energized, the polar opposite of their recent stumbles. Ironically they found energy on the second night of a back-to-back, whereas even with rest the weight of their failures seemed to drag them down in previous games. With the offense opened up, Harden and Paul danced on the Pacers and attacked the rim with the level of elan necessary to get their season back on track. The defense wasn't quite as successful as it has been in recent games, but the uptick in offense more than made up for it. The biggest concern about this game was that Clint Capela knocked knees early in the first quarter and sat briefly before returning to play. He seemed as good as ever, complete with rim-rocking alley-oop finishes, but sat out the last several minutes of the game due to caution of head coach Mike D'Antoni's part. The team is hopeful he will be ready to go as the Rockets prepare to visit the Denver Nuggets on Tuesday, but knee injuries are always concerning. This very warranted caution saw the Pacers trim back Houston's lead significantly while Capela was not on the court to bend the offense and protect the rim. Thankfully for them, the lead was big enough to survive even a cold-shooting spell near the end of the game. Gary Clark acquitted himself well and is making an excellent case for being in the starting lineup. The undrafted rookie forward continues to be able to hang with NBA lineups and is capable of credible defense, something rookies typically have trouble with. He also can hit three point shots (2-5 tonight) while James Ennis III has lately been unable to (0-3 tonight). They aren't in direct competition, but they both credibly fill that wing defender slot Houston is so anxious to populate, and Clark so far looks like the better and bigger option. There was little to dislike from a Houston perspective tonight, which is as good of news as they can hope for at the moment. The mission for the Rockets right now must be to bottle this emotion and energy, put distractions behind them, and start to roll again. Now they just have to try to convince the other teams in the NBA to work with them on it.